Arsenal clashed heads with Watford at Vicarage Road earlier tonight hoping to get a win on the road in the Premier League. The Gunners began the match on the offensive and scored in the 10th minute courtesy of Pierre-Emerick Aubameyang’s goal. The Hornets suffered a major blow just a minute after the opening goal when Troy Deeney was sent off for a raised elbow on Lucas Torreira. The visitors dominated possession against the 10-men of Watford but couldn’t add to their goal tally in the first half. 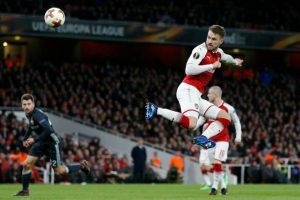 Both teams fought tooth and nail in the second half, but Unai Emery’s men managed to hang on to their narrow advantage and grinded out a 1-0 victory on the night. Let’s take a look at how each Arsenal player performed during the contest against the Hornets. The German keeper made two important saves to deny the Hornets attackers from scoring. He kept a well-deserved clean sheet at Vicarage Road. He was deployed as a makeshift right-back, and for once, Mustafi did enough to restrict the Watford forwards from scoring a goal tonight. The Greek defender had his hands full while dealing with the pace of Andre Gray. Overall, it was a solid display from him. The French centre-back used all his experience to lead the Arsenal defenders to a rare shut-out away from home. The Spanish full-back kept his calm under pressure and defended valiantly in his own half. It was a very matured display from the experienced campaigner. The Uruguayan suffered an elbow from Troy Deeney which saw the Hornets talisman get his marching orders. Torreira was later subbed at half-time despite an impressive first-half display. The Swiss midfielder kept things ticking in midfield and was careful when on possession of the ball. It was a frustrating outing from the Armenian international. He wasted some glorious opportunities to score which would have given Arsenal some breathing room in the game. The Welshman struggled to get anything going for him in the opposition half. He tried a few flicks and flashy passes but with no end product. The Gunners winger was always willing to take on the Watford defenders and made some lung-bursting runs down the wide areas. However, he lacked composure in the final third and was guilty of squandering a few excellent chances. The Gabon international was fortunate to score in the 10th minute after Ben Foster’s howler. 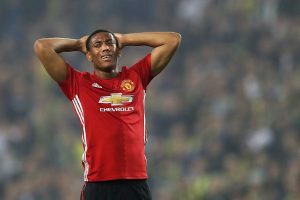 However, his teammates hardly gave him any service throughout the match, and in the end, he couldn’t add to his goal tally. Emery’s plan to replace Torreira for him at half-time backfired as the German talent failed to get himself involved in the game. The French youngster was often out of position and brought some confusion to the Arsenal midfield. Liverpool Prepared To Match €25m Release Clause For German Midfielder: Wise Move For The Reds? Arsenal Given A Huge Boost In Their Pursuit Of Manchester United Star: Should Wenger Go All In? Arsenal Eyeing Up A Move For 25 Y/O Fulham Defender: Where Does He Fit Into Wenger’s Plan? 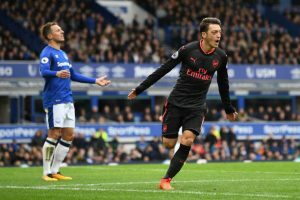 Arsenal Playmaker Draws Fresh Interest From Juventus: Is Serie A His Best Destination?